This is not a cosplay! Fei’s early Korean royal court #hanbok design is revealed. Like we said in our previous post, after we considered the Northern European-style design, we also imagined Fei dressed in a Korean hanbok. Rocket of Whispers is set in a country where European culture and Eastern religions mingle. 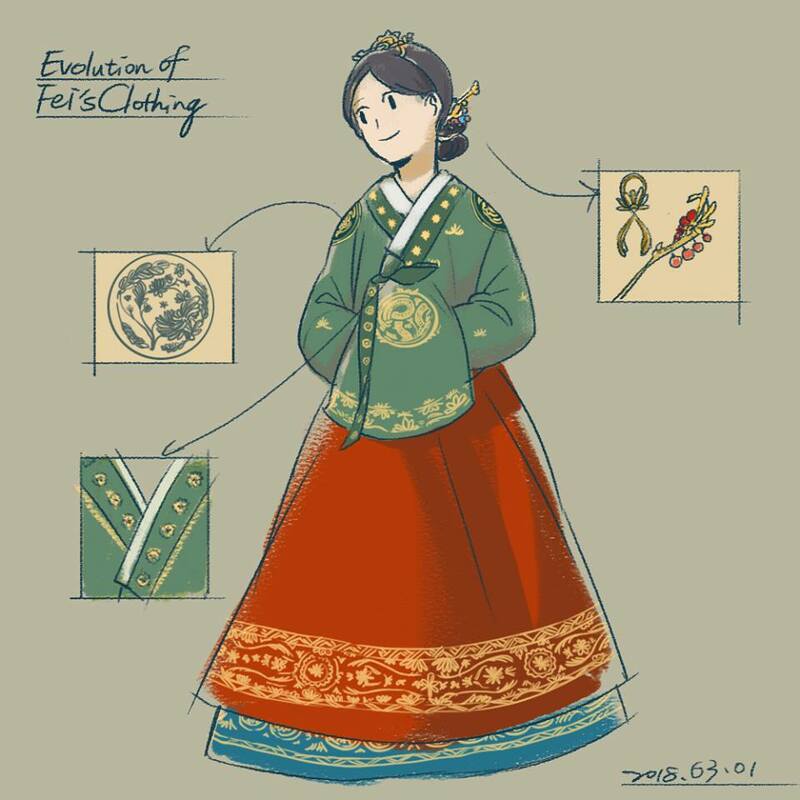 Since Fei is of Asian descent, we also imagined Fei dressed in a traditional Korean hanbok, with overlapping collars, long coat strings, and a puffy chima skirt. Why did we choose a traditional Korean royal court dress? The answer lies in its brightly colored design! We dressed Fei in an emerald-colored dress often worn by Korean noblewomen, which includes embroidered golden patterns and intricate stitching. To reflect her character as a witch of Earthology, we gave Fei a hair ornament made from gold and jade. The golden flower embroidery on her chest and shoulders signifies her prominent social status. As we said above, we chose a Korean hanbok because of its colors. However, Fei’s emerald upper garment and John’s military-green jacket and shirt are too similar. We wanted to create a strong contrast.